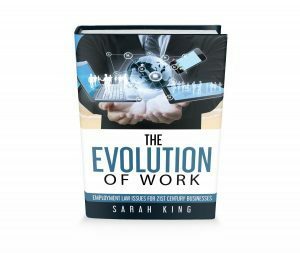 Excello employment lawyer Sarah King has published her first book focusing on employment law issues for 21st century businesses. Called ‘The Evolution of Work’, the book is a practical and easy to read reference guide for employers focusing on key topics including the status of workers – from zero-hours and gig economy workers, to the self-employed and employees – as well as working models including flexible, agile and home working, the use of technology in and outside the workplace, social media and future considerations for employers covering artificial intelligence, Brexit and virtual reality. Each chapter concludes with a useful checklist for employers to review their policies and processes ensuring they reflect the changing nature of work. ‘The Evolution of Work’ is available as both an e-book and in paperback from Amazon.